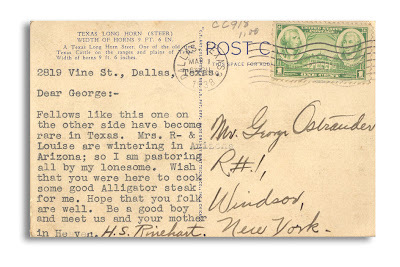 Postcard featuring Texas Long Horn steer, dated march, 1938. Fellows like this one n the other side have become rare in Texas. Mrs. R- & Louise are wintering in Arizona; so I am pastoring all by my lonesome. Wish that you were here to cook some good Alligator steak for me. Hope that you folk are well. Be a good boy and meet us and your mother in Heaven. 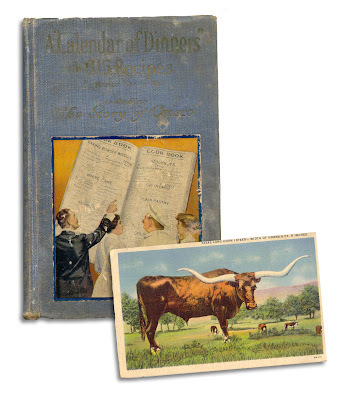 Found in a well-worn copy of "A Calendar of Dinners in 615 Recipes - Including the Story of Crisco" by Marion Harris Neil. Published by Proctor and Gamble, 1914 (8th edition). How much for this book? I MUST know the story of Crisco!! Also LOVE old recipe books! I love how on the cover of the book, any time "lard" appears in a recipe it is crossed out and replaced with Crisco!